Haven’t decided on a hotel yet? You can look at other available hotels in the Picardy region with Booking.com. 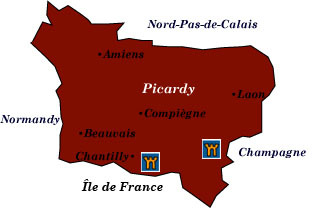 Nowhere will you find such contrast in the endeavors of man when you visit Picardy. From the sublime, soaring Gothic cathedrals to the cemeteries that give testament to the insanity of war at the Valley of the Somme, Picardy has much to offer. Surprisingly, visitors often overlook the region while in a hurry to reach somewhere else, but for those who love architecture and history, you’ll find a wealth of uncrowded attractions. Cathédrale Notre-Dame Imagine a Gothic cathedral twice the size of Paris’s Notre Dame. This is the biggest church in France, a tribute to Gothic architecture, and a UNESCO World Heritage Site. Built to house the head of John the Baptist, its construction began in 1220. Musée de Picardie Housed in a Second Empire palace, three sections are dedicated to archaeology, the Middle Ages, and 16th- 20th-century European art, including works of El Greco and Tiepolo. Maison Jules Verne Science fiction purists will want to make a pilgrimage to the author’s home. Battle of the Somme Memorials The first Battle of the Somme in WWI lasted 4 1/2 months and cost 1.2 million lives. Memorials, museums, and remains of the old trenches are spread out throughout the valley and may be reached by car, minibus tours, and (most) by public transportation. Compiègne Under Napoleon III, aristocrats and their hangers-on gathered for hunting parties at the glorious 1337-room Château de Compiègne. Château de Pierrefonds In 1857 Napoleon III commissioned architect Viollet-le-Duc to reconstruct a 14th-century crenellated château originally built by Louis d'Orleans. Although not entirely authentic, this massive castle does come with a moat, drawbridge, and towers. Beauvais Competition to build Gothic cathedrals in the most superlative fashion led to the Cathédrale St-Pierre once being the tallest cathedral in France—until its collapse in 1284. Rebuilt but never finished, it still remains a poignant and ambitious masterpiece of Gothic architecture. Laon Laon has been fortified since the time of the Romans, and medieval ramparts still surround the town. However, it’s the Gothic Cathédrale Notre-Dame de Laon that draws the visitors. On the site of a 12th-century cathedral, six towers and exquisite stained-glass windows make this one of the great cathedrals of Picardy.